I used all root veg here, from the garden. Those "not-so-perfect-looking" carrots were cut up into spears. The potatoes quartered. The turnips sliced. The parsnips diced. I added some rosemary and sea salt to taste. I make my own, but store bought is cool too, and easier I suppose. Pour that to coat the veg. Roast it all at 425 F /220 C until tender. My baking ordeals are the same. It's maddening. Sigh. I added radishes to the next meal. I usually throw in red onion too, but mine didn't grow bigger than an acorn this year. ....and why are they called red onion, they are purple, people....gheesh. My best guess is a nutriton problem with your onions, too few whatever and maybe short on rain ... and redonions are generally smaller. Don't try to plant the m again next year - they will probably go into bloom and be no use. Just enjoy the little you have and make the best out of it. Well maybe it was a colour blind gardener who named them. Those veggies look delectable and delicious! Yummy....did Ruby at least try them? I can't say that vegetables always look good, but these really do! Yum! 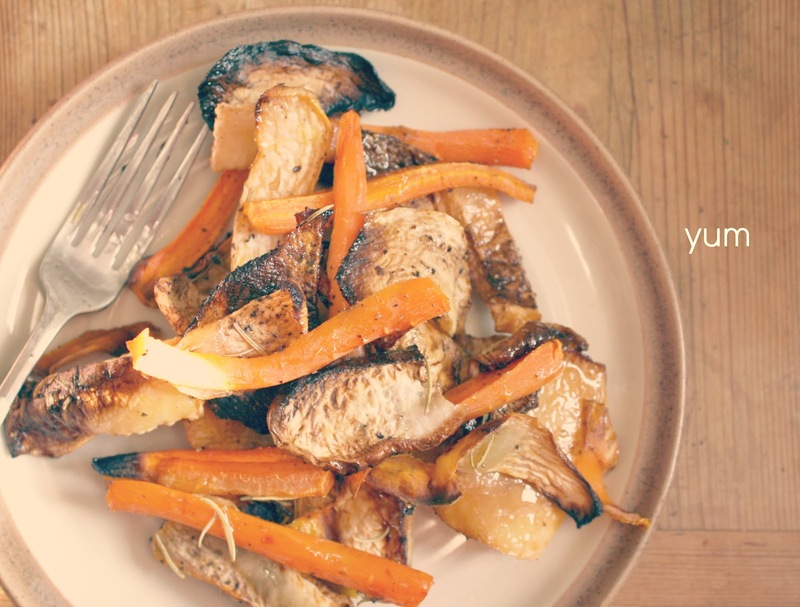 Roasted veggies look yummy! How do you make your own Balsamic Vinaigrette? And I have to agree, the last pic is 'priceless'! !